As a new parent, I’m learning the hard way about child-induced sleep deprivation. Let’s just say coffee has become my new best friend. One book that caught me and my wife’s attention was introduced to us via Facebook links from friends of ours that thought we might be able to relate. 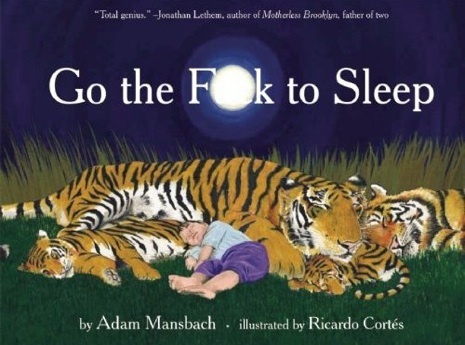 The book was entitled “Go the F*** to Sleep” and was written by Adam Mansbach and illustrated by Ricardo Cortés. As punk rock parents, my wife and I appreciated this no-nonsense approach to parenting and related to the frustrations every parent faces when trying to get a little shut-eye. According to Wikipedia, Mansbach’s two year old daughter Vivien took up to two hours to go to sleep. Exasperated, Mansbach posted on Facebook “Look out for my forthcoming children’s book, “Go the F*** to Sleep.” His post received enthusiastic response from his friends and this response inspired Mansbach to actually write the book. Advance pdfs of the book began to be distributed via e-mail and the book became a viral sensation even before it’s scheduled release of October 2011, which is this month. The book was #1 on Amazon’s best-selling list by May of 2011 and so the publishers decided to push the release date up to June of 2011 with an increased printing of 150,000 copies. The film rights have even already been optioned by Fox 2000 and all of this is due to it’s popularity on social media sites like Facebook. A true testament to the power of social media. Tags: Adam Mansbach, Go the F*** To Sleep, Jewish Community Center of the East Bay, News, parenting, Ricardo Cortes, Samuel L. Jackson.